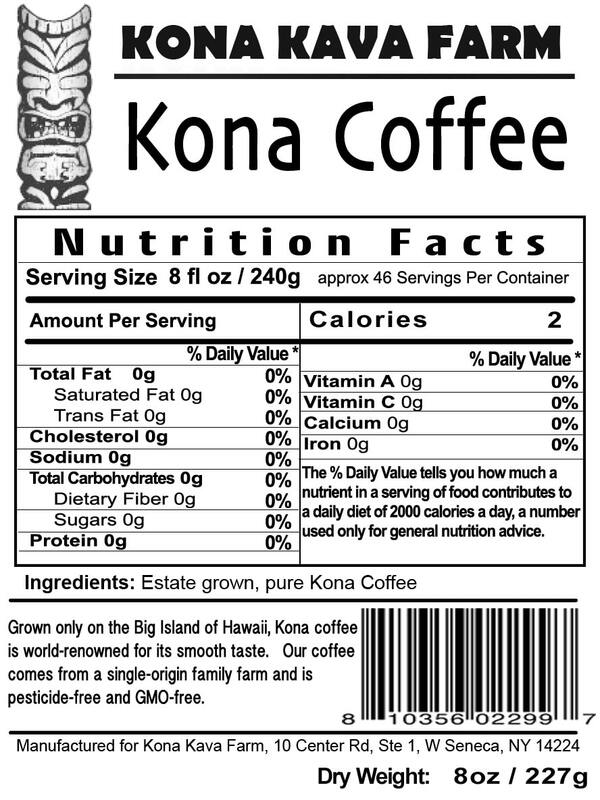 Our pesticide-free, GMO-free Kona Coffee is world-renowned for its smooth taste and easy drinkability. We source all our coffee from Lions Gate Farm, a 10 acre family farm on the Big Island of Hawaii. 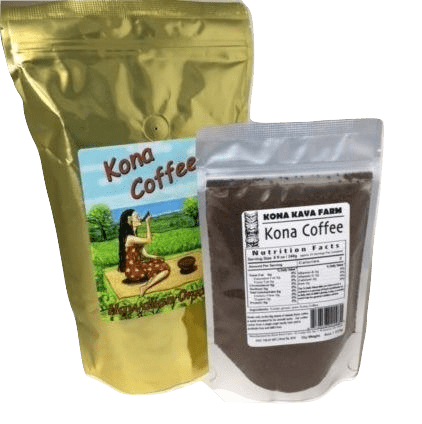 Kona Coffee is a perfect compliment to the kava products that you know and love! 4oz. $7.99 4oz. 7.99 Kava Points. 8oz. $12.99 8oz. 12.99 Kava Points. 16oz. $24.99 16oz. 24.99 Kava Points. We are proud to announce the arrival of authentic ground Kona Coffee to our ever-growing line of quality products from Oceania. Coffee has been grown on Hawaii for centuries, and the tropical climate, abundant rain, and fertile soil provide a perfect growing environment. 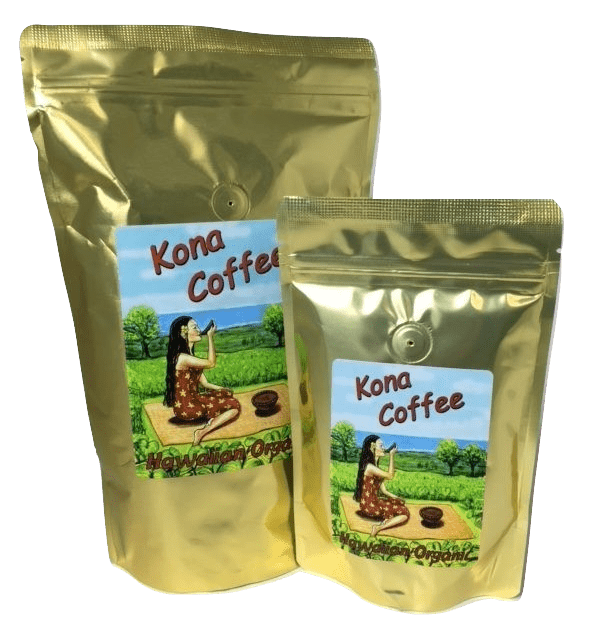 Kona, Hawaii is considered the best coffee in the world, and renown for the estate-grown Kona Coffee that comes from just one tiny little town on one tiny little island in the middle of the ocean. Since we’re a small reseller of Kona Coffee, all Kona Coffee beans are roasted to order. If you order a full pound of coffee beans, we’ll grind that entire pound in our beyond FDA-compliant facility in sunny California. With a high turnover rate, our Kona Coffee is always fresh, picked at the peak of perfection, and stored in a very controlled environment until it’s time to ship the beans fresh or ground to you. We also offer Kona Cold Brew Coffee from Happy Kava Brand. If you like to enjoy your coffee cold, with a deep rich taste that’s free of the usual acidic nature of hot-brewed coffee, then Kona Cold Brew from Happy Kava Brand might be a perfect fit. This pesticide and GMO-free coffee is sought after for its smooth taste and easy drinkability. We source all our coffee from Lions Gate Farm, a single-origin 10-acre family farm on the island of Kona, Hawaii. While you’re here, why not check out our other high quality products from Hawaii and beyond that are the perfect complement to your cup of joe. 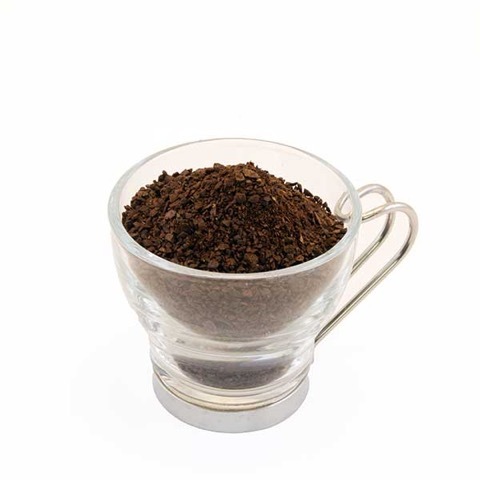 From Custom Kava Blends that you can choose by effect, to our Kavalactone 30% Capsules and our Kavalactone 55% Paste, there’s bound to be something you’ll enjoy as much as your ultra-fresh, organically-grown coffee from Kona, Hawaii. We offer a medium-dark roast, combining the best of both worlds. Medium roasts accentuate the Kona flavor, and is full of body without ever being harsh or bitter. Typically tastes slightly sweet, but with a little kick to it. Medium roast is often preferred by those who like to taste the regional highlights in their coffee. With a slight dark roast element, there are just a few caramelized sugars that give this special roast a smooth flavor with a slightly sweet aftertaste. We keep a light touch on this roast so the Kona varietal shines through. The dark roast also adds a touch of smoothness to the Kona Coffee, and goes well at any time of the day.